What Is the Rustic Style? One of the most popular decorating themes is rustic, but what exactly does that mean? As it turns out, quite a bit. “Rustic” is a rather general term referring to a look or style that is rough, aged, natural in shape or color, tied in to a natural theme, casual, and often old-fashioned. While a rustic accessory or piece of furniture might also be an antique – in which case, we would call it primitive – it can also be brand new, but manufactured or designed to look old or used. Either way, it’s a wonderfully welcoming, cozy, and versatile decorating theme that can carry a room on its own, or play well with many other decorating styles. Read on for tips and tricks on working the rustic vibe into your own bedroom. While rustic is a general term referring to rough, primitive or distressed appearance, there are several more-defined decorating styles that fall underneath the rustic umbrella. Country, of course, is the style most associated with rustic furnishings. Other decorating styles known for their rustic flair are mission (like the bedroom shown here), lodge, coastal, cottage, Tuscan or Mediterranean, and Mexican. While most often you'll find a palette of neutrals or earth tones in a rustic room, that doesn't mean that color—even bright color—doesn't have a place as well. The green walls in this bedroom are on the verge of brightness, and yet don't take anything away from the overall easy, rustic style. Still, it's best to refrain from color overload with this decorating theme. David Agnello / Grace Home Design, Inc.
A log cabin might be rustic, but it doesn’t have to be uncomfortable, without charm or suited only to the campground. In fact, a log cabin bedroom can be simultaneously primitive, romantic, and soft; if you don’t believe that, then take a look at the lovely bedroom from Grace Home Design, Inc. shown here. A tree-trunk table, log walls, distressed wooden floors, antler-trimmed mirror, and rustic dresser spell “mountain lodge.” The comfy, overstuffed chaise, however, along with the luxe, thick white comforter indicate that this is a bedroom with all of the best amenities. When skillfully done, mixing up decorating styles can create a winner. This room takes the prize. While you can certainly take the rustic look all the way in your bedroom décor, it’s not a requirement. In fact, one of the best ways to spice up just about any other decorating theme is with only a taste or two of rustic style via accessories or small pieces of furniture. In the room shown here, a tree trunk with casters is a delightful take on the traditional bedside table, while the small rabbit pelt, pinecone, and dried flowers in an old-timey vase finish the scene beautifully. Perhaps the decorating theme most associated with rustic furnishings and accessories is country in its various manifestations. As country is a casual, welcoming, and full-of-the-feel-of-history style, it makes sense that its primary look is worn, well loved, imperfect and often downright primitive. The bedroom shown here (from Kate Davidson Design Inc.) is full of delightful rustic country charm. 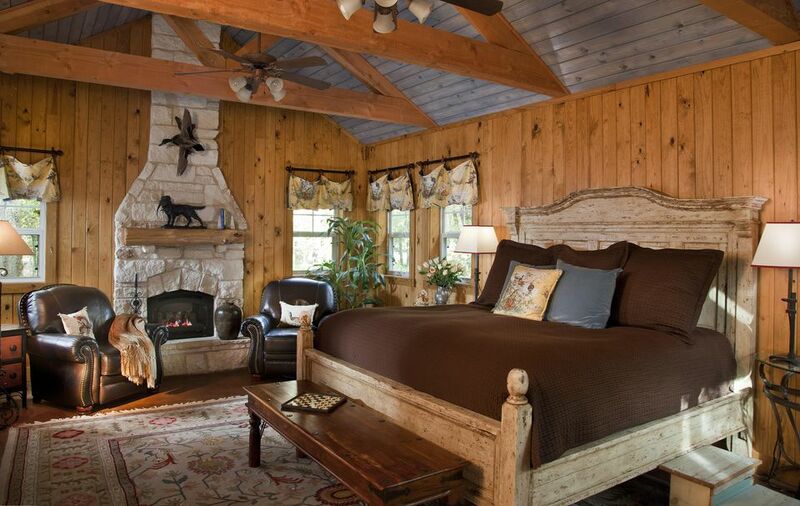 The rusty barn star, paneled walls, striped rug, and wrought iron bed are pure country. Just because a room is decorated in a rustic style or with rustic furnishings doesn't mean it has to be uncomfortable, or even without touches of luxury. Case in point: the room featured here. Rustic furniture and faux-paneled walls are nicely balanced by the cozy sweater-knit throw pillow, subdued gold, brown and white quilt, and shams with a rough-hewn, yet still of-the-moment ogee-inspired print. While rustic is often associated with country style, it doesn’t have to be. In fact, you can even add a dose of rustic character into an otherwise contemporary bedroom quite successfully. The platform bed, modern side table, gray bedding, and strong area rug in the room featured here (designed by Applegate Tran Interiors) are very current, but the rough wooden headboard and gathering of small branches add a wonderful touch of the great outdoors to the scene.